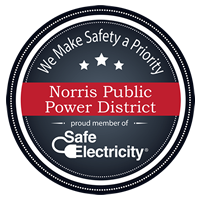 Electrical safety education is an important part of Norris Public Power District’s commitment to our customers. Our goal is to reduce preventable injuries and to save lives by educating not only children, but adults as well. The District has available a high voltage safety demonstration that shows first-hand some of the dangers of coming in contact with live electrical equipment. The demonstration also educates the public on how to react in an electrical emergency, such as a car accident with downed power lines around or on a vehicle. The safety demonstration trailer is available for presentations. To arrange for a presentation to your group or school, contact Trevor Wehrer, Manager of Operations and Safety, at (402) 223-4038 or twehrer@norrispower.com for more information.